On leaving the airport turn right. This is the road to St Pierre du Bois and L’erée bay. After .9 of a mile you will see a brown sign on the right side of the road to the Gold & Silversmiths, follow this sign. At the end of this short lane you will get to a T - junction, turn right signed Le Gron and St Saviours church. This takes you around the northern boundary of the airport and you will see the runway and your right hand side. Pass by Bruce Russell's Gold and Silversmith on your right. After a quarter of a mile you will come to another T- junction, turn left follow the signs for Wood carvers and strawberry farm. After about 400 M Wood carvers will be signed posted left, DO NOT turn left. Carry straight on passing Le Piques country hotel on your left. After a third of a mile you will get to another T- junction turn left sign posted reservoir, you will see the spire of St Saviours church. After 200M turn right sign posted Kings Mills, after 1 mile you will arrive at another T- junction, turn right into La Grande Moulin where you will find Les Granges des Fleurs 50M on the left hand side. On leaving the ferry port you will arrive at a large roundabout. Take the second exit (St Julians Avenue), proceed up the hill. Pass through three sets of traffic lights. Immediately after the third set of traffic lights carry straight on. Do not turn left into Queens Road. This will bring you into the Rohais. You will pass the entrance to Safeway supermarket on your right and then St Pierre Park Hotel on your left. Just after St Pierre Park Hotel turn left up Castel Hill. Pass straight through the traffic lights at the top of the hill. You will observe a large church on the right. At the next cross roads you will come across a yellow filter in the road. You will see a sign post directing you to turn left for the Fleur du Jardin. 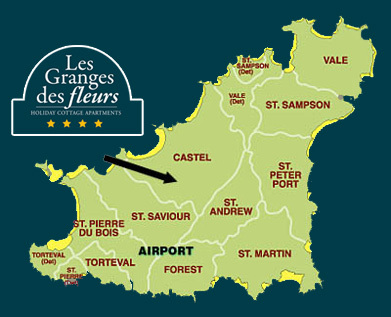 Follow this sign and you will find Les Granges des Fleurs approximately ½ mile down this road on your right hand side. 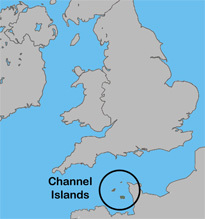 If you get lost just give us a call on 01481 256879 or 07781 107475 and we will direct you as best as possible.